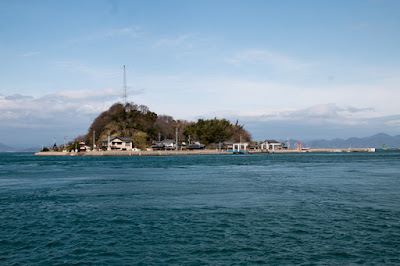 Kurushima castle (来島城) spreads over whole part of Kurushima island, a small island of 300 meter long and 100 meter width faces Kurushima straight and only 300 meter apart from main body of Shikoku island. 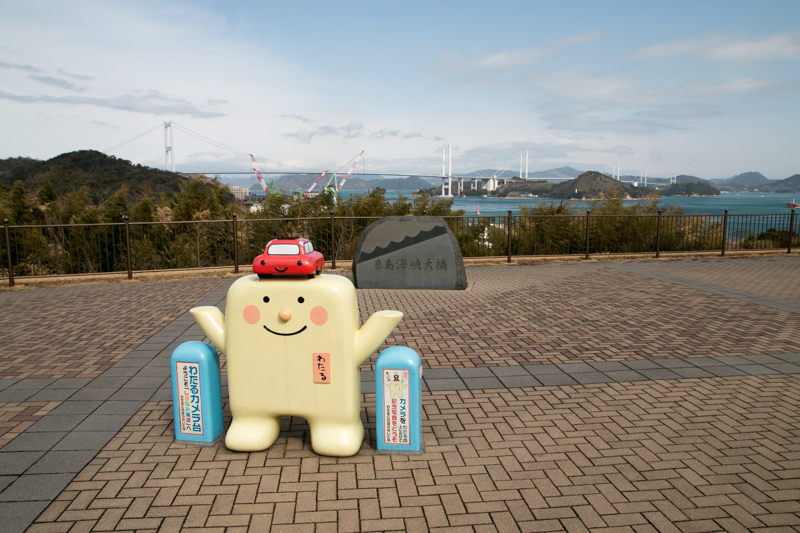 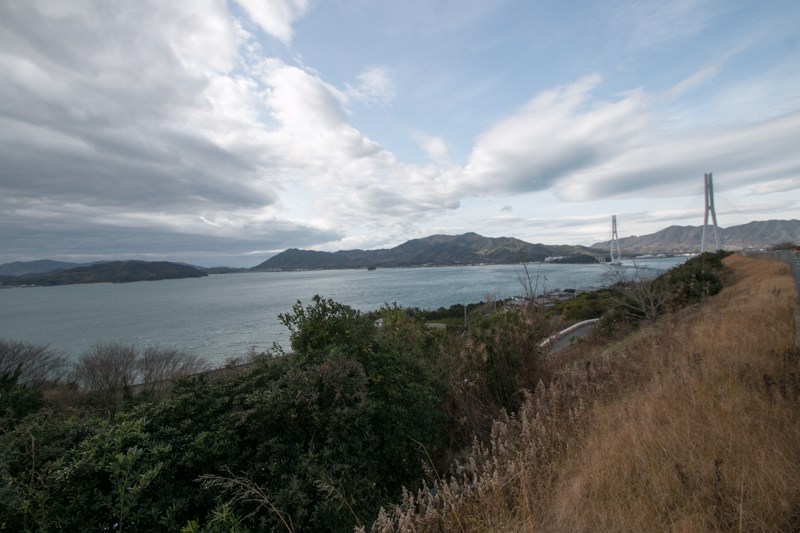 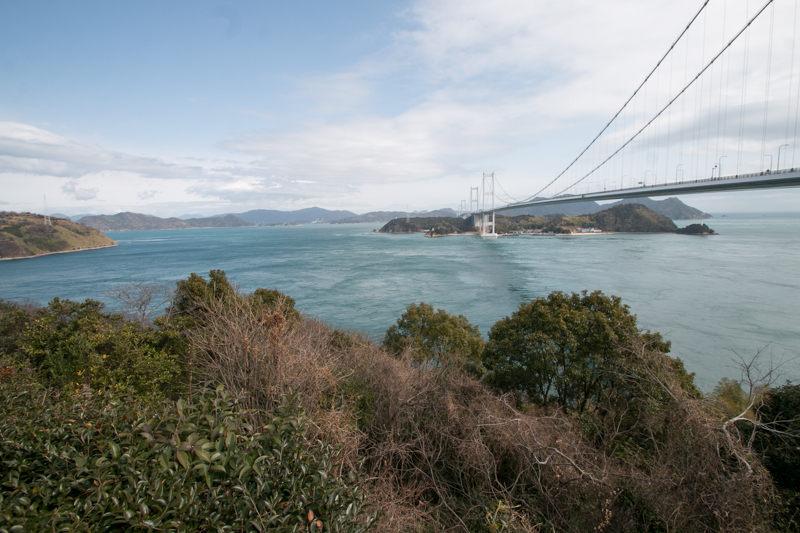 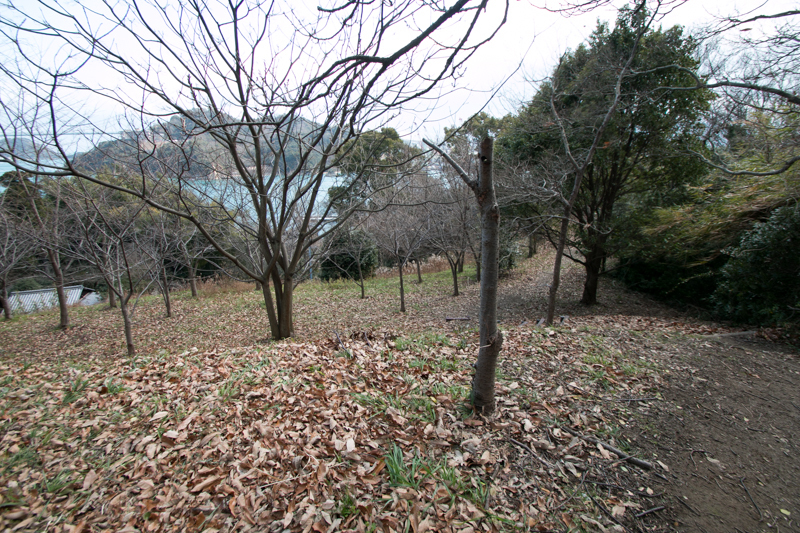 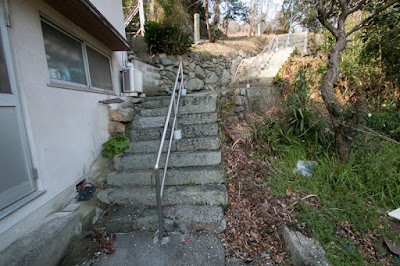 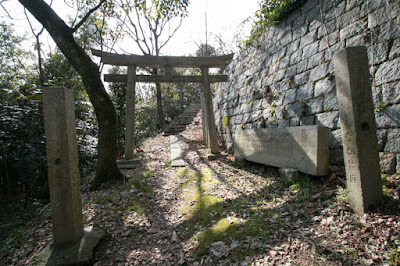 Castle site locates in the north part of Imabari city, and at the Shikoku side end of Imabari-Onomichi route of Honshu Shikoku bridge crosses Setonaikai sea. 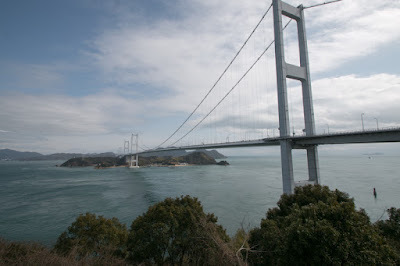 There are three route of bridges between Honshu mainland and Shikoku island, it mean Naruto Kobe route passes Awaji island, Kojima-Sakaide route runs over Shiwaku island, and Imabari-Onomichi route crosses Geiyo-Shoto island. All of these routes are built using three group of small islands of Setonaikai sea, as it is impossible to built one direct connecting bridge because of technical and budget limitation. In medieval era, of course there was no bridge, but these small island were also used as a crossing route between both side. 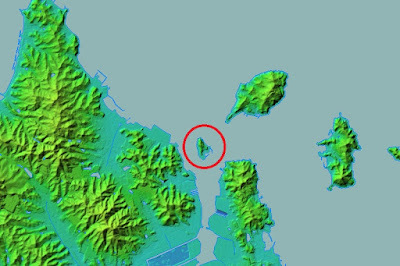 Additionally, these island became a safe anchorage for ships to pass typhoons or storm. On the other hand, narrow straights between island brings swift current, and every ship needed navigator to pass these area. Furthermore, it was possible to control marine transportation between Kinki region and western Japan, by shutting limited control points. Even around 1900, before Japan-Russian War, Geiyo fortress was built at Oshima island next to Kurushima island to prevent intrusion of Russian fleet. Because of these reason, sea clan had prospered at these islands from ancient era. In peace time, people of these sea clans engaged in marine transportation and commerce, and also acted as navigators of passing ships with tolls. 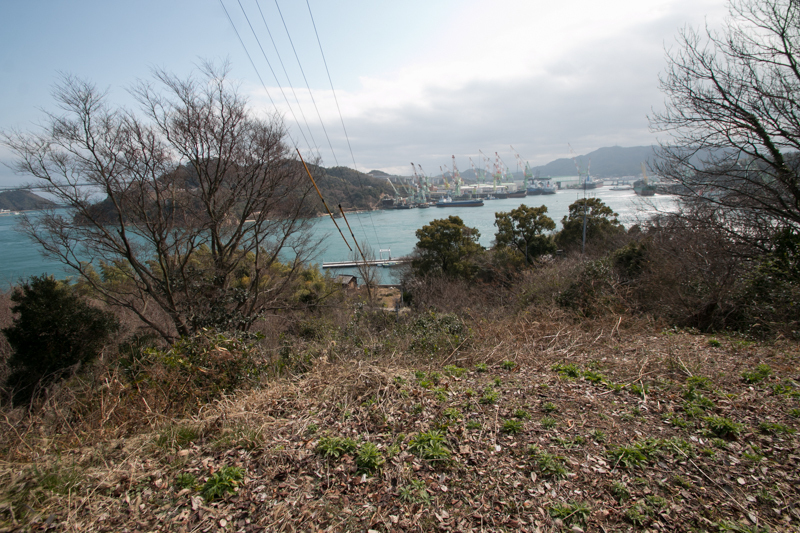 In wartime, these people turned to the navy and attacked enemy area from sea and obstructed supply transportation of enemy. 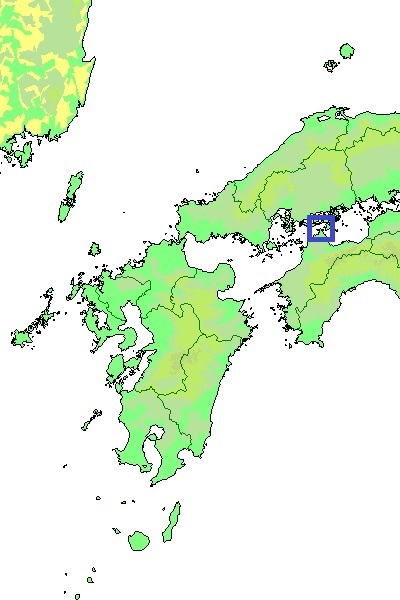 People around Geiyo islands, Shiwaku islands and Awaji island were called as Murakami navy, Shiwaku navy and Awa navy respectively. 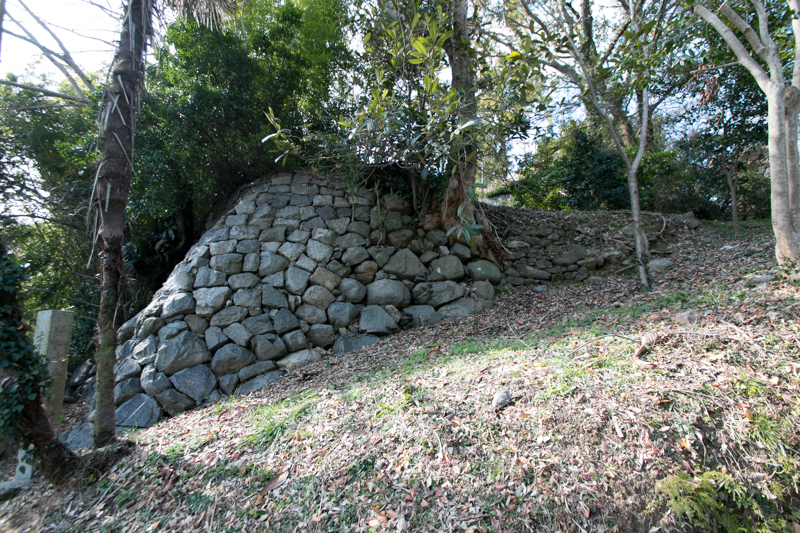 These people are often called as pirates, but it was more closer to Vikings, and had played important roles in the history. 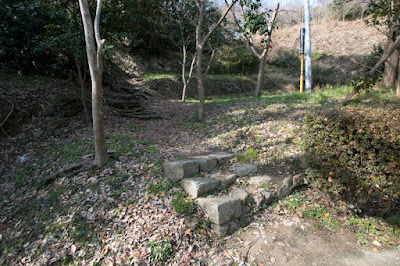 In 939, Sumitomo Fujiwara (893-941) who was a distant relative of Fujiwara clan which was the highest noble family, gathered local sea people and rebelled to the government. 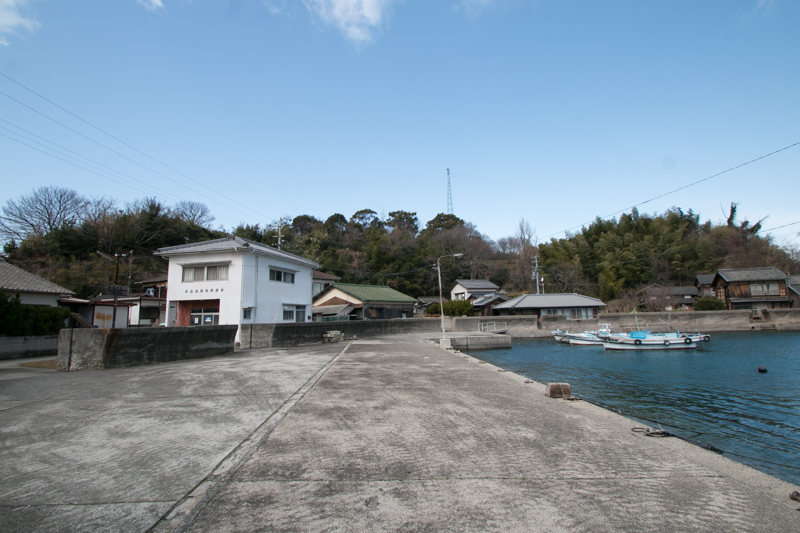 As it occurred simultaneously with the rebellion of Masakado Taira (?-940) and it was difficult to defeat marine people hided at island, it took two years to suppress this rebellion. 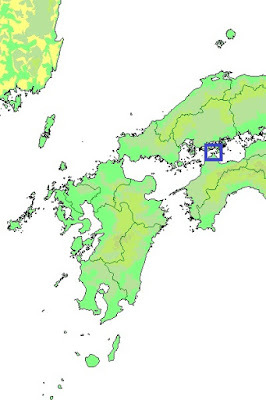 After the fall of Sumitomo Fujiwara defiant activities of sea clans still continued, but since 11th century Taira clan became the governor of western Japan controlled these sea clans and controlled Setonaikai sea. 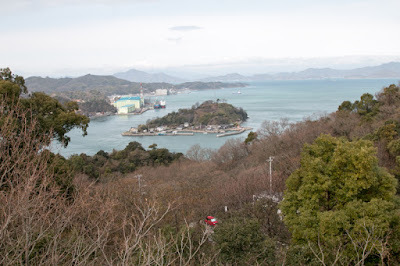 Maritime trade of Setonaikai sea toward continent became an economic base of Taira clan, and based on its wealth Kiyomori Taira (1118-1181), the leader of Taira clan, became the grand minister and established his government prior to Kamakura Shogunate. 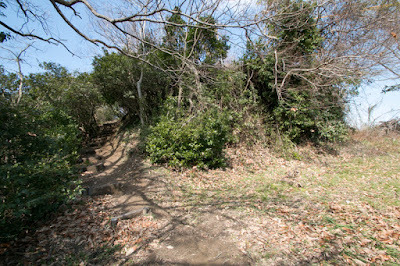 At the conflict between Taira clan and Minamoto clan after the death of Kiyomori, sea clans at Setonaikai sea at first supported Taira clan. 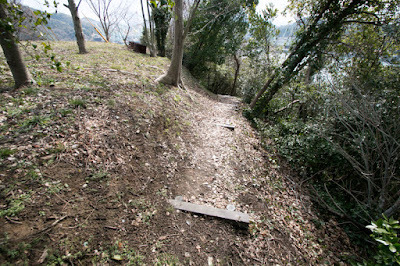 But after the defeat of Taira clan at the battle of Yashima, these clans turned to Minamoto clan, and contributed to the victory of Minamoto clan at the battle of Dannoura, a large naval battle occurred at narrow path of Kanmon straight. After the fall of Taira clan, Kamakura Shogunate let the control of Setonaikai sea to Kono clan, a local lord which belonged to Minamoto clan and became the governor of Iyo province (Ehime prefecture). At the same time, people of Murakami clan which was a distant relative of Minamoto clan and lived at north part of Shinano province (Nagano prefecture), moved to Setonaikai sea and lived at small island. 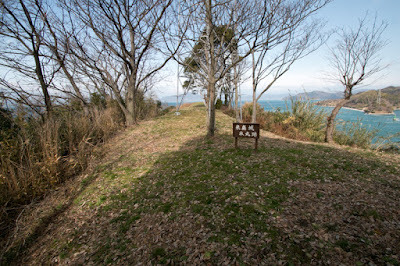 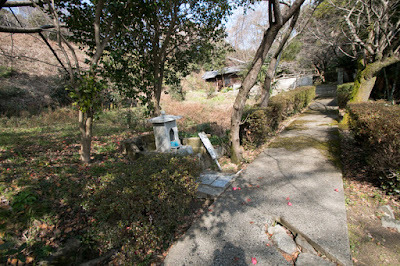 Later Murakami clan divided into three houses, which were Innoshima Murakami family which lived at Innoshima island at the north part of islands, Noshima Murakami family which built Noshima castle at Noshima island, a small one next to Omishima island at the middle part of island, and finally Kurushima Murakami family stayed at Kurushima island at the south edge of straight. These three families cooperatively controlled naval supremacy of Setonaikai sea. 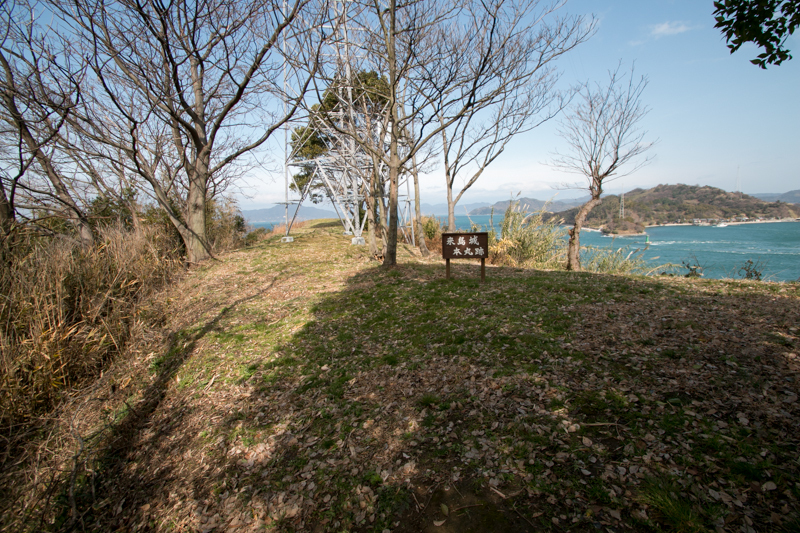 But because of its geographical condition, Kurushima clan which was the closest to Shikoku island had a deep relationship with Kono clan. 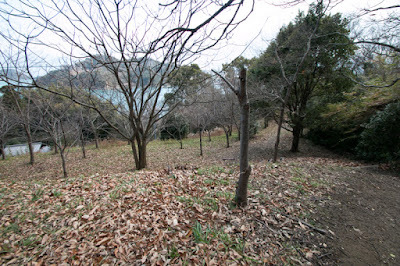 Originally Kurushima clan lived at Tomiyama castle located at the side of current Hashihama port at Shikoku island. But in the middle of 15th century, Kurushima Murakami family built a fortress at Kurushima island and used is as their residence. 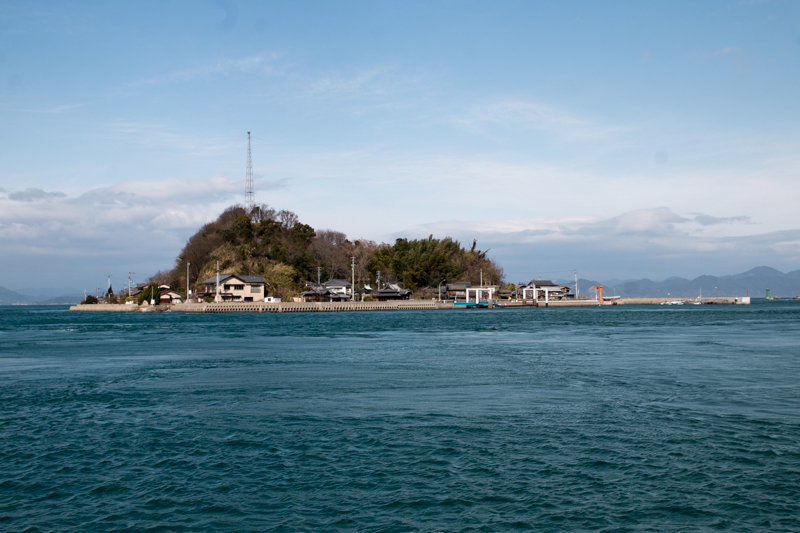 Kurushima island was a small island but being surrounded by swift current it was difficult to attack it from sea. 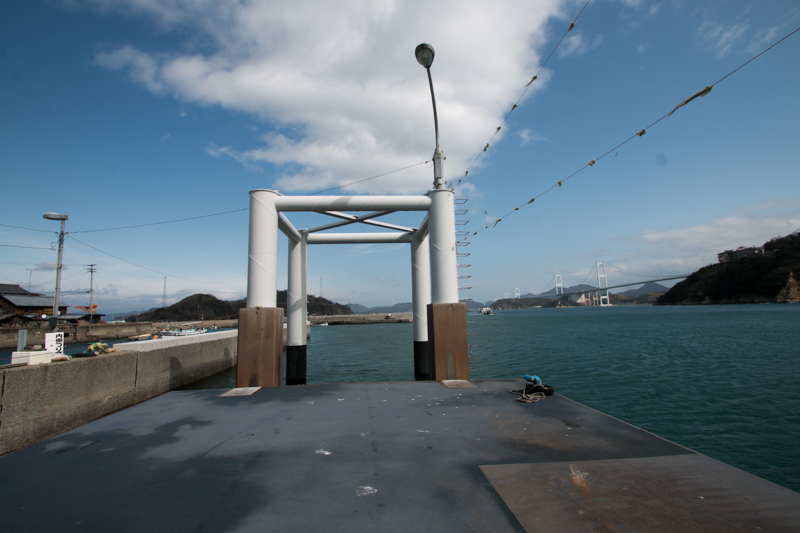 In addition to this, it locates at the entrance of narrow bay of Hashihama port, and it could protect Hashihama area as a safe port. 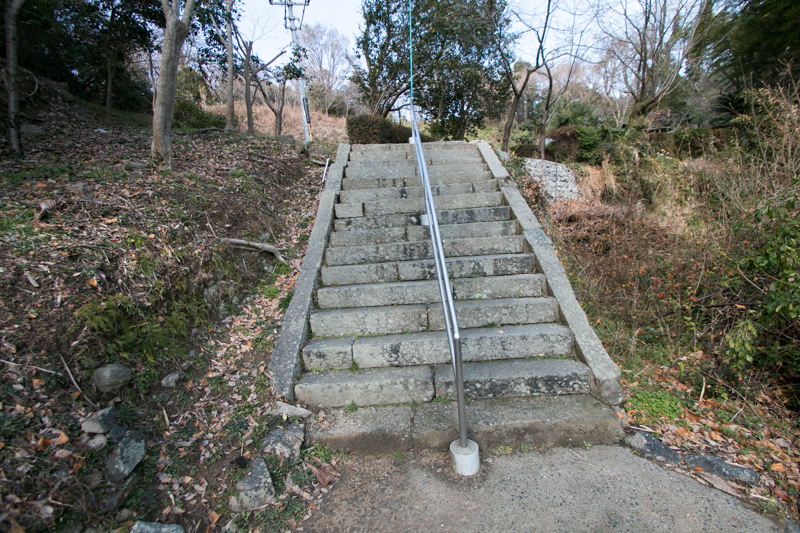 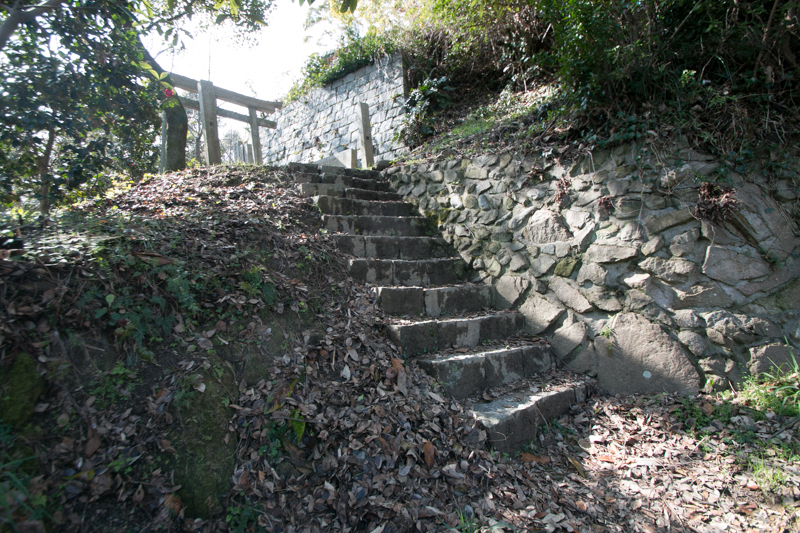 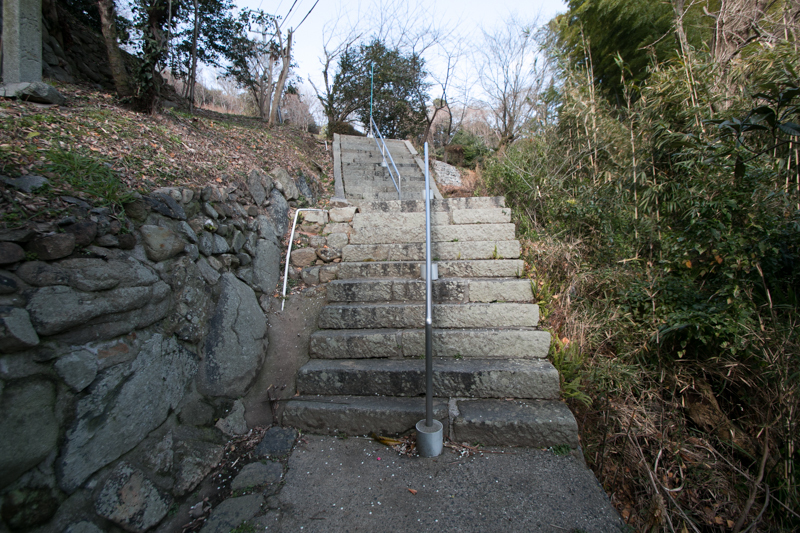 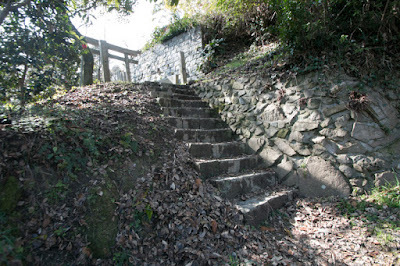 Kurushima castle is built using three level terraces of Kurushima island. The top level is a narrow ridge over 300 meter spreads from north to south at western edge of island, being separated into central area at the highest point of the island, secondary area and third area. 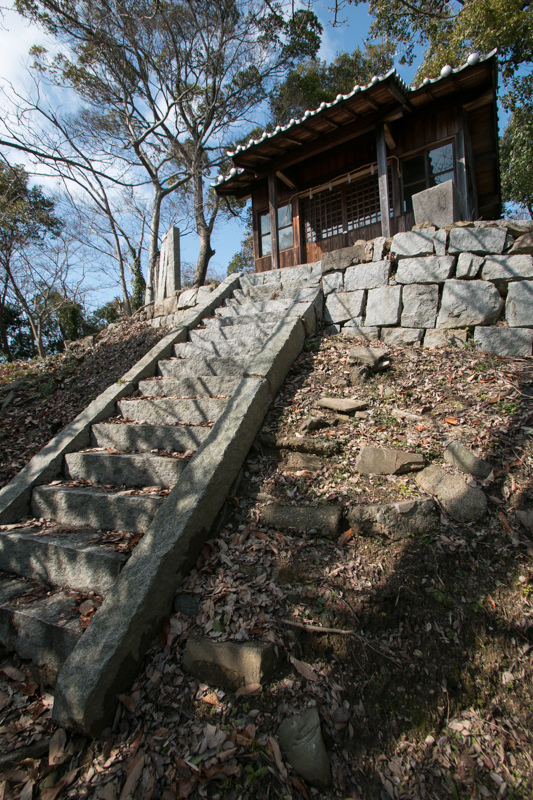 The middle layer is a flat space of 100 meter long square, and was used as a residence of the lord called as "Shingetsu-An". 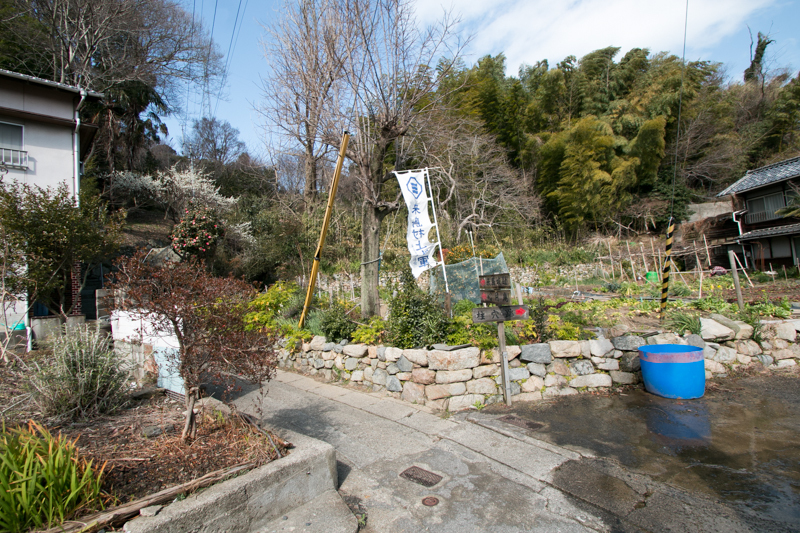 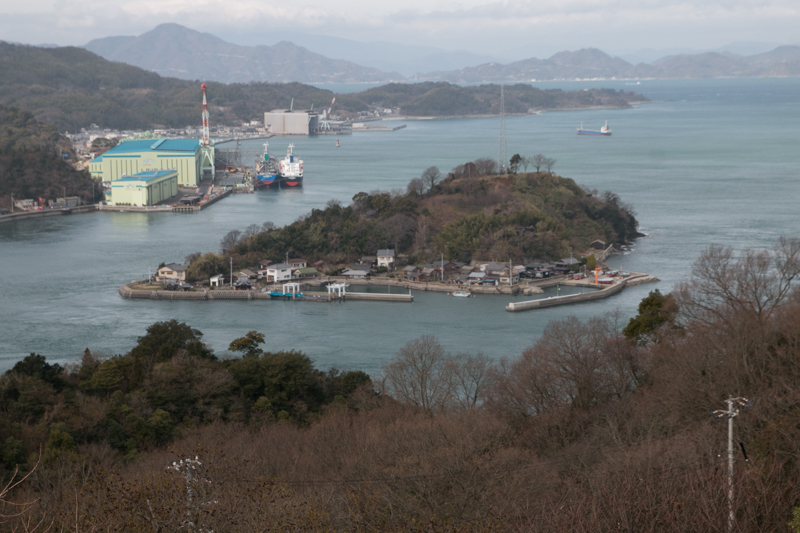 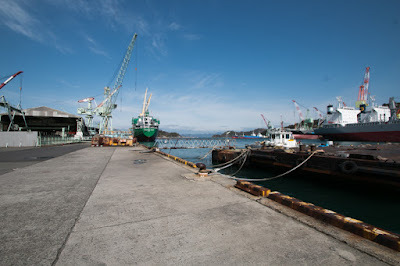 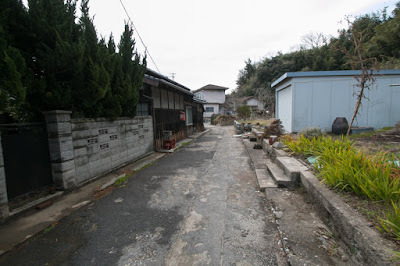 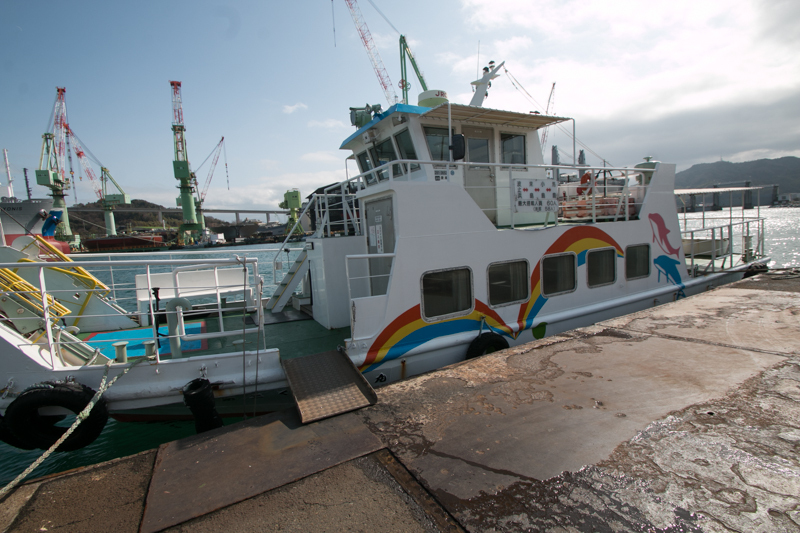 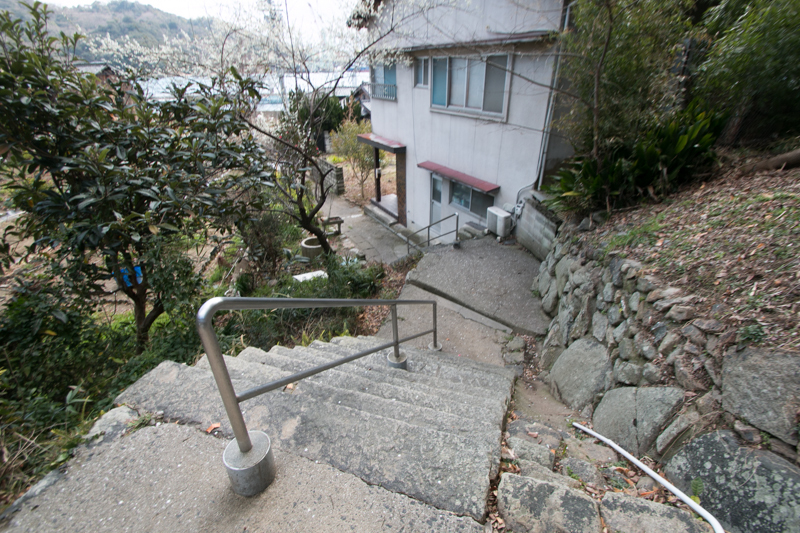 The lowest level spreads around Kurushima port is used as a residence of people, along with warehouse and dry dock. 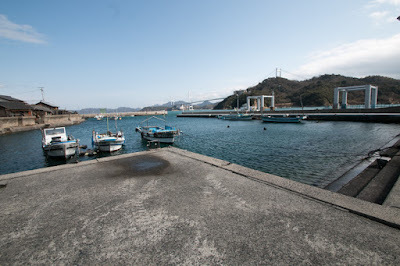 A wooden piers surrounded the island, and at the time of low tide holes dug at the rocks to built the structure of pier is seen. 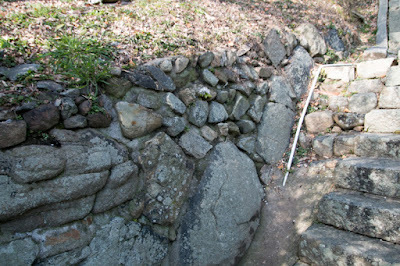 Core part of the castle might be covered by stone walls, and there remains a part of this stone wall at the entrance of third area. In Muromachi era, Kurushima Murakami family became an important retainer of Kono clan and supported it. 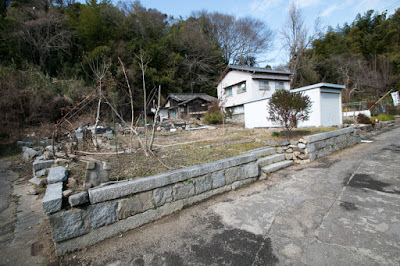 In the middle of 16th century, Michinao Kono (1500-1572) who did not have a son once attempted to place his son in law Michiyasu Murakami (1519-1567) as a next leader of Kono clan, but facing the opposition of other retainers Michinao and Michiyasu left Yuzuki castle (Ehime prefecture) which was the main base of Kono clan and once resided at Kurushima castle. 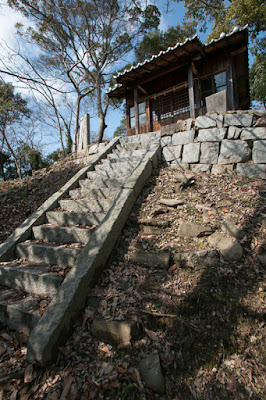 Later Michiyasu reconciled with other retainers of Kono clan and lonely struggled to save weakening Kono clan. 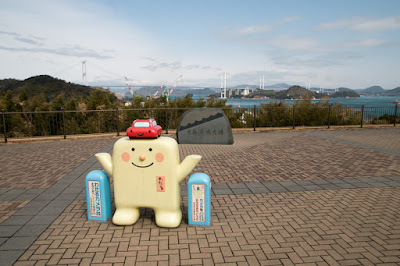 On the other hand, Murakami families also supported Motonari Mouri (1497-1571), the ruler of Chugoku region uplifted from small lord of Aki province (Hiroshima prefecture) defeating large powers such as Ouchi clan and Amago clan. As Murakami family conflicted with Ouchi clan for commercial interests at Setonaikai sea, at the battle of Itsukushima in 1555 between Motonari Mouri and Harukata Sue (1521-1555) who virtually took over Ouchi clan, Murakami family supported Mouri clan and broke ships of Harukata who landed at Itsukushima island then contributed the victory of Motonari. 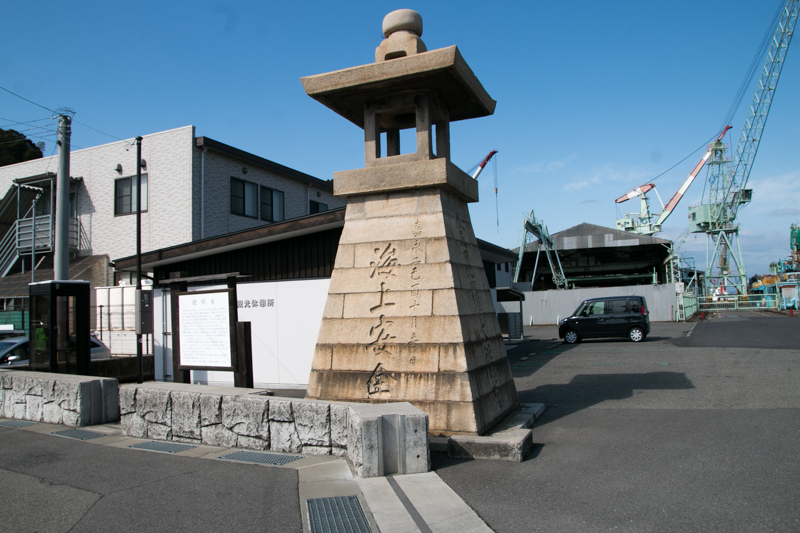 After that over 25 years Murakami families cooperated with Mouri clan and worked as their navy along with other neighbor navies. At the conflict between Mouri clan and central ruler Nobunaga Oda (1534-1582), at first Mouri navy including Murakami family overwhelmed naval force of Nobunaga at the first battle of Kizugawa river in 1576. But two years later, in 1578, Nobunaga who attempted the revenge brought large battleship protected by iron board and defeated Mouri navy. At the same time, Hideyoshi Hashiba (1537-1598, later Hideyoshi Toyotomi), a regional commander of Nobunaga, started his campaign against Mouri clan. 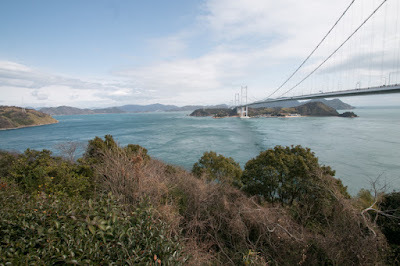 To achieve naval supremacy, Hideyoshi tried to invite Murakami family to his side, and at last, Michifusa Murakami (1561-1597), the leader of Kurushima Murakami family, left Kono clan which was controlled by Mouri clan and turned to Hideyoshi. 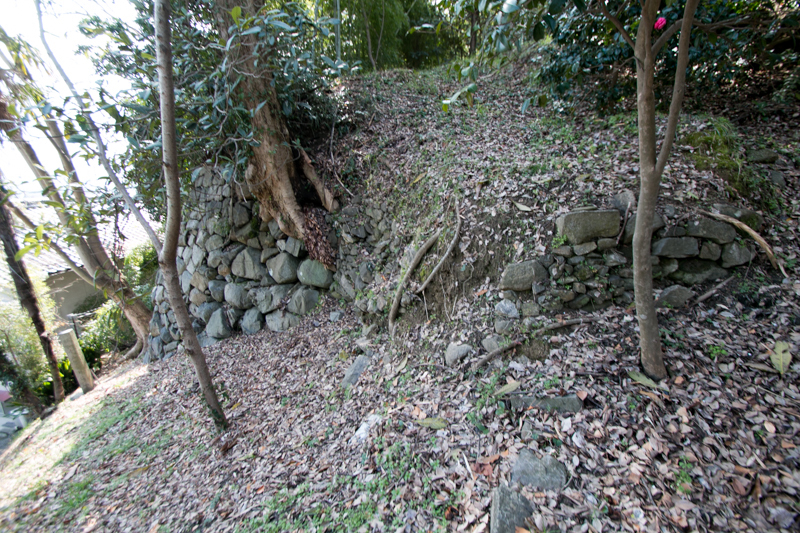 But facing the attack of Kono clan and Mouri clan, Michifusa lost Kurushima castle and once exiled to Hideyoshi. But under Hideyoshi, Michifusa restored his navy and fought for Hideyoshi. 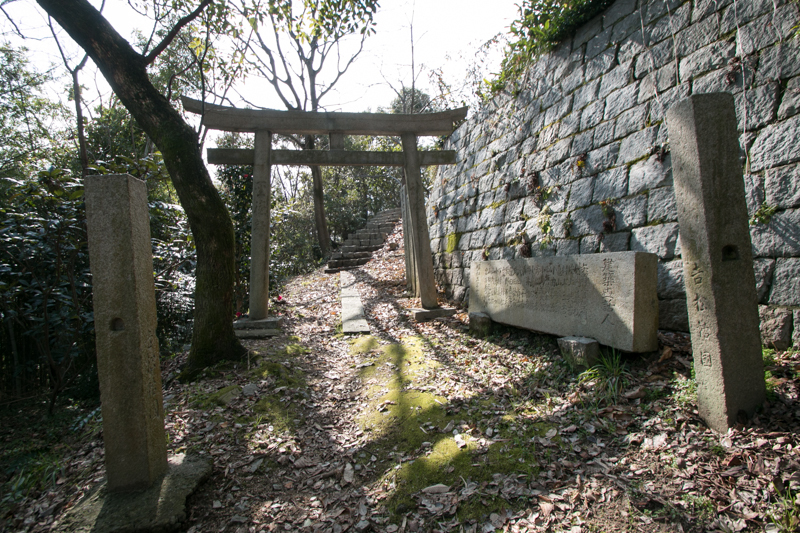 When Hideyoshi became the ruler after the death of Hideyoshi, Michifusa became the lord under Toyotomi government. 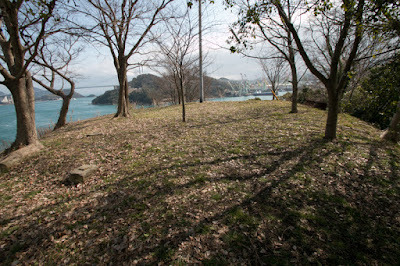 and changed surname as Kurushima clan. Michifusa formed a part of Toyotomi navy, but Michifusa died in the naval battle at foreign expedition. 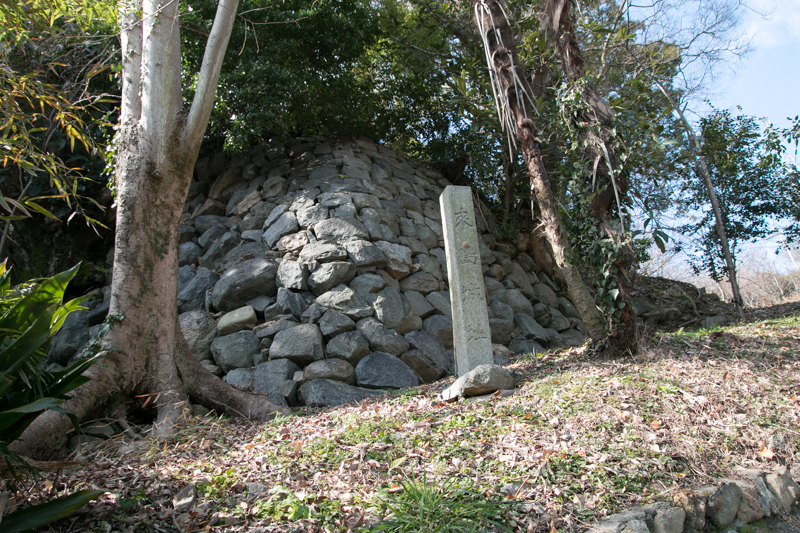 Furthermore, after the death of Hideyoshi, Nagachika Kurushima (1582-1612), son of Michifusa, at the battle of Sekigahara between Ieyasu Tokugawa (1543-1616), the largest lord under Toyotomi government, and Mitsunari Ishida (1560-1600), the chief administrative staff of Hideyoshi, indirectly supported Mitsunari through Mouri clan. 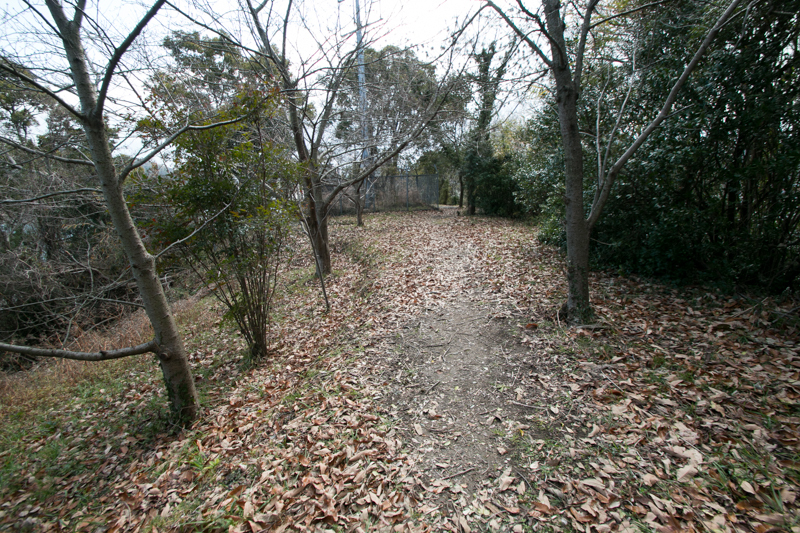 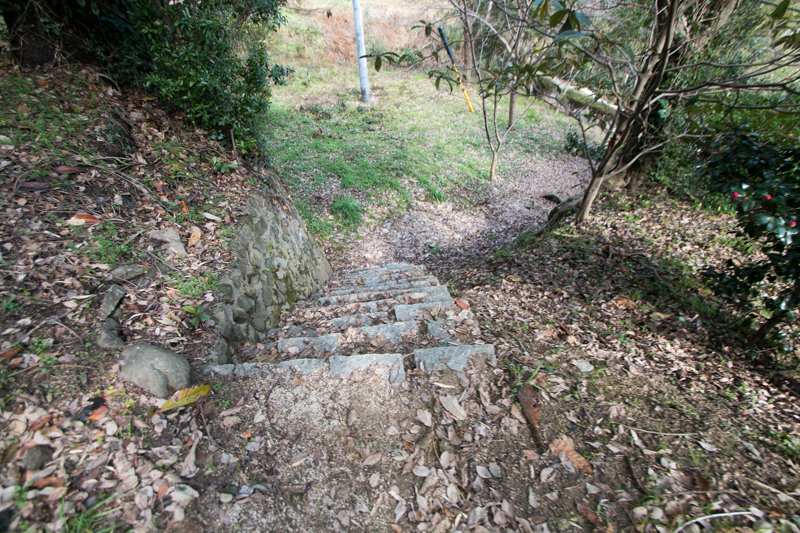 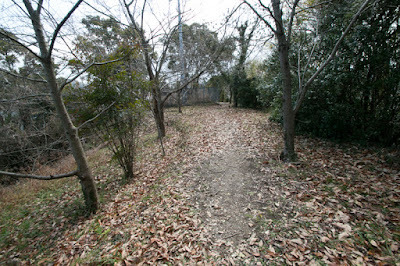 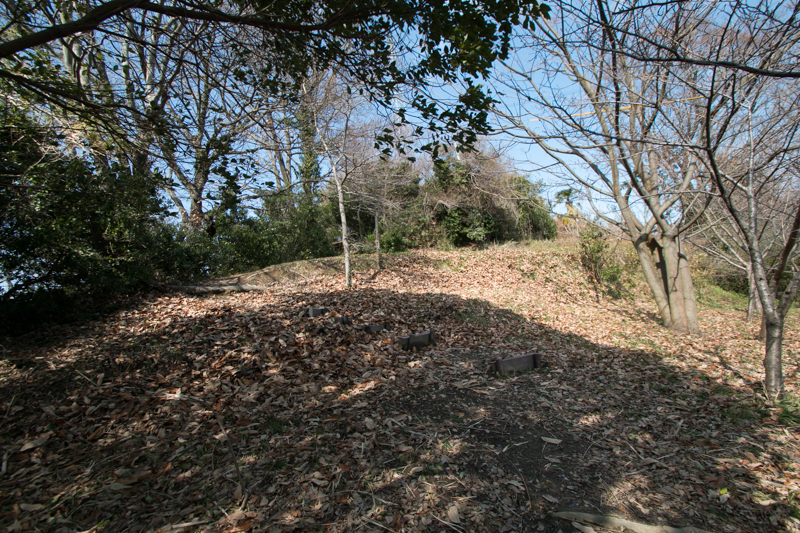 But Mitsunari was defeated at the battle, and Kurushima clan also lost their territory and Kurushima castle. Next year Nagachika was forgiven by Ieyasu, but central authority who wanted to grasp the transportation directly did not allow the autonomy of sea clan any more. 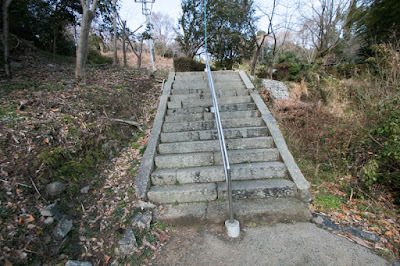 Kurushima clan was transferred to a mountainous area of Bungo province (Oita prefecture), along with other sea clan such as Kuki clan which was moved to Mita domain (Osaka prefecture) and Ayabe domain (Kyoto prefecture). 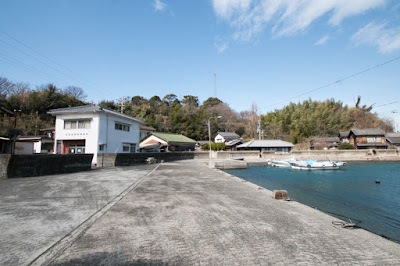 Now the history of Murakami clan as a sea clan over 300 years had ended, but Kurushima clan itself could continue as a feudal lord by the end of Edo era. 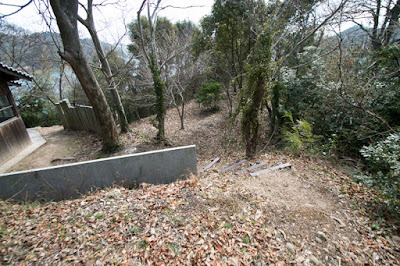 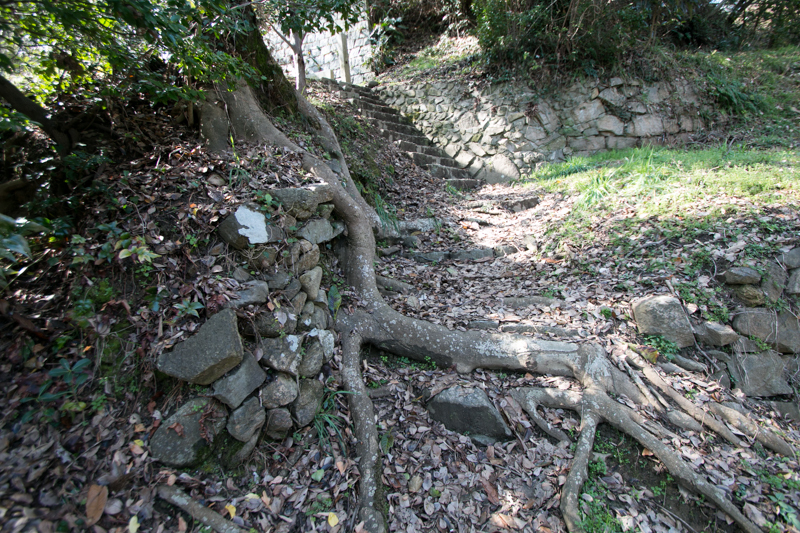 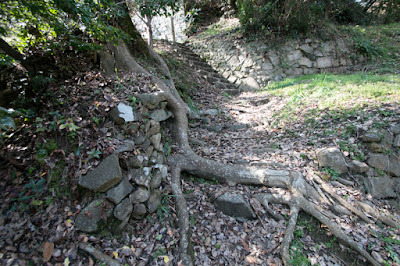 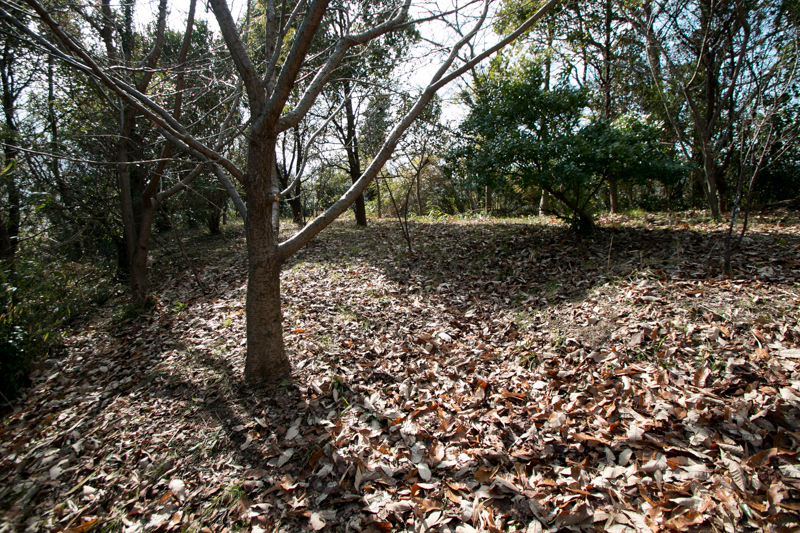 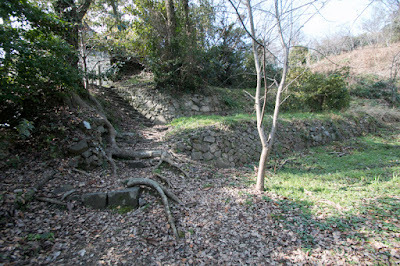 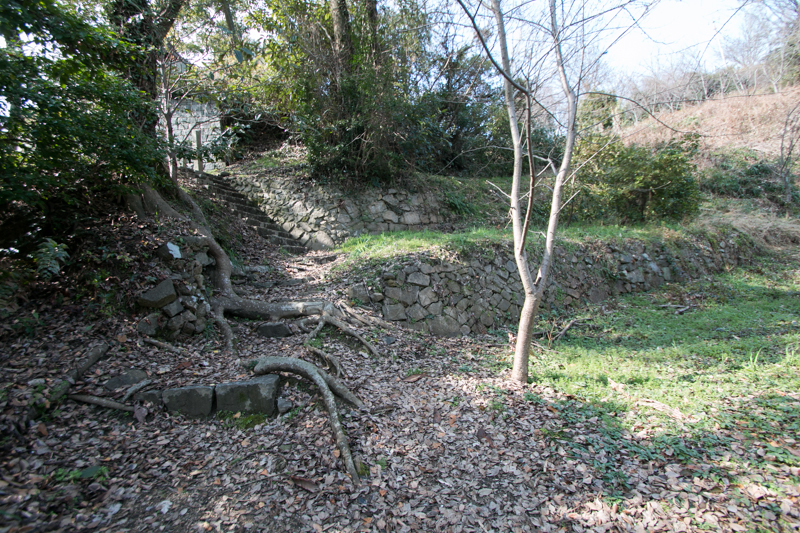 Kurushima castle was destructed after the movement of Kurushima clan and its materials was used for the construction of Imabari castle (Ehime prefecture). 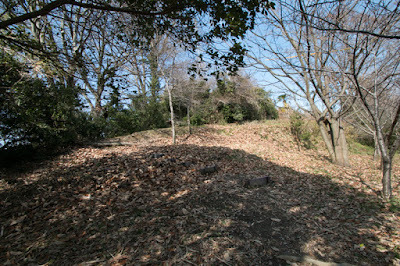 Lower areas are covered by houses, but terraces of the island still keeps former shape of the castle. 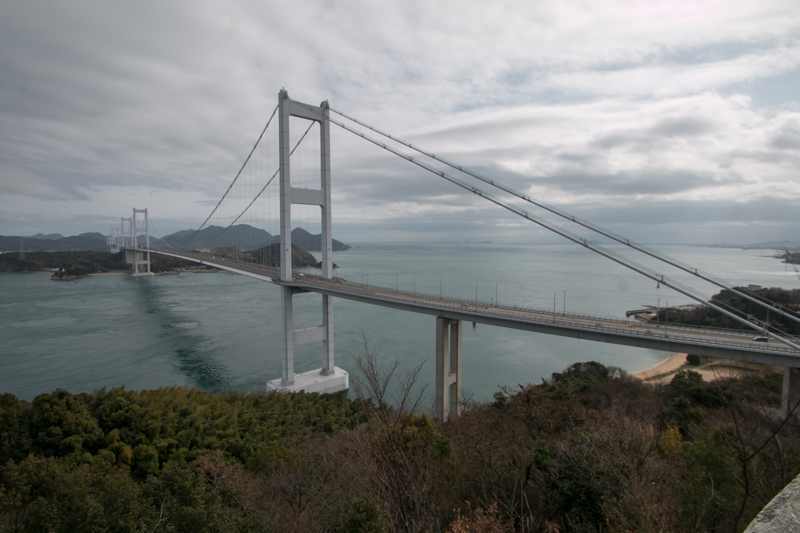 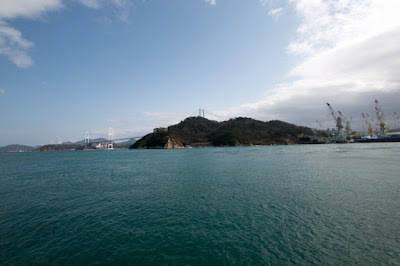 Combination of magnificent Kurushima-Kaikyo bridge over Kurushima straight and anchoring ships near Kurushima island shows unchanged importance of marine transportation at this area and former glory of Murakami navy, although it has a different shape. 5 minutes ride of ferry boat from Hashihama port to Kurushima island (be careful that there is only one cruise per one or two hour). 15 minutes drive from Nishiseto Jidoshado Expressway (Shimanami Kaido) Imabari-Nishi interchange to Hashihama port.